The first Republican ad of the 2016 election shows Sen. Rand Paul as a World Wrestling Entertainment contender against Obama in a “Brawl for Liberty,” as the Patriot Act is due to sunset on Sunday. The ad also attacks competing Republican candidates. "Defender of freedom, Senator Rand Paul!" the announcer yells. 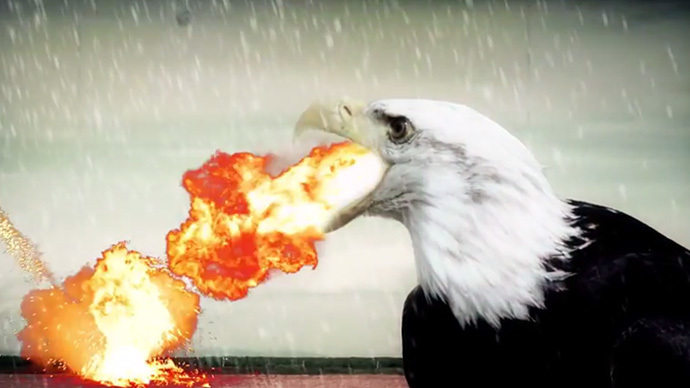 The video then shows Paul's head superimposed on the torso of a shirtless muscle man standing in front of an American flag. A cloud of flames explodes in back of him. He's taking on President Obama or, his wrestling name, "Obama the email reader." He is aided by his "so-called conservative" sidekicks. Meet "The Capitulating Canadian," Sen. Ted Cruz (R-Tex. ), who is battling Paul in real life for the 2016 nomination. Cruz is pictured wearing shorts and boxing gloves and standing in front of the Canadian flag, flanked by a moose and Obama. Paul's other competitor is Sen. Lindsey Graham (R-S.C.). The announcer says Graham is "trying to read your emails while doing donuts in a 1997 Geo Metro." The pink car ends up in flames. "Watch them battle it out under the dome on the floor of the United States Senate," the ad says. The Super PAC ad is a multi-platform digital campaign that will include Facebook, Twitter and search advertising. Sen. Paul has been critical of President Obama’s call on the Senate earlier this week to compromise and extend The White House-backed House bill with key provisions of the Patriot Act in order to reform America’s surveillance capabilities, Sen. Rand Paul said Obama was being “disingenuous” and could end the program himself. However, former National Security Agency contractor Edward Snowden exposed the agency’s controversial meta-data program in 2013, which led Obama to say last year he would curb some aspects of the NSA’s authority. He supported passage of the USA Freedom Act, which would have ended the NSA’s bulk collection of telephone data and reformed the way it accessed such information, but the measure failed in the Senate over the weekend. Senate Majority Leader Mitch McConnell (R-Ky.) is calling the Senate back into session on Sunday, May 31 – just hours before the midnight deadline – but it's not clear lawmakers will have any new solution.